Established in 1999, The Crossing Land Education Centre is a unique not-for-profit educational camp on the Bermagui River where young people learn about living simply, conserving resources and caring for the earth in a hands-on and practical way. Educational experiences at The Crossing aim to develop greater self awareness, confidence, enthusiasm and initiative in young people. The Crossing provides conservation education experiences that develop young people’s capacity to live more sustainably. The Crossing encourages young people to adopt sustainable conservation practices including permaculture design for water reuse, energy saving and habitat protection. The Crossing also promotes youth musical talent from the Far South Coast at the Cobargo Folk Festival. The Crossing has a unique stage and youth space for musicians between 14 years and 21 years of age. The chance to play at the festival offers young and emerging musicians a great opportunity to express their own sound, perform original material and to gain stage confidence and experience in front of a music savvy crowd. Young artists are encouraged to hone their skills at the many festival educational workshops, many of which are designed to help develop musical skills and techniques. 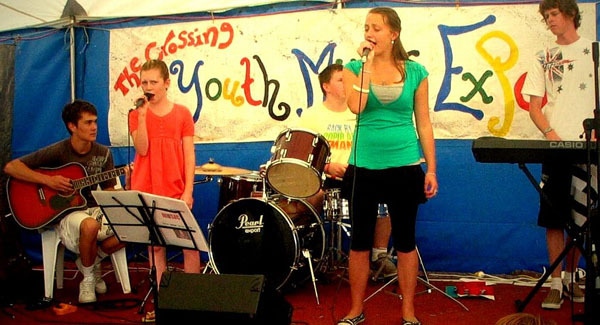 Past workshops have included beat box, stagecraft, song writing, singing, drumming and guitar techniques. Several Bega Valley artists who got their start on The Crossing Youth Stage are now appearing at major festivals and other events in Australia and overseas. The youth stage is a welcoming and intimate space where music goers can come and feel the beat together as one! If you are interested in performing at The Crossing venue, please Click Here and fill in the form. © 2007 - 2019 Yuin Folk Club Inc. All Rights Reserved. Website Design and development by 2pi Software.